iClassPro has always offered an audit log which tracks changes within the software performed by different users or customer accounts (parent portal activity). This is most helpful when each staff member accessing the software has their own designated login. It can be used for troubleshooting what happened with a customer account or to see who performed what action. With recent changes, this feature has found a new home. 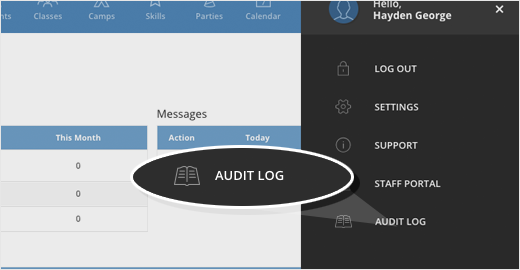 The Audit Log page is now located conveniently in the User Panel for the business owner and admins to be able to access easily from any page of the software! This search will find information in the Member Name, Username, Source, IP Address and Action columns to help you further define the information you are looking for. This new filter makes it easy to isolate activity over a specific date or date range, rather than scrolling through the list of results to find the appropriate date. By default, this field will include only the last 30 days of data. PRO TIP! A larger the date range entered, means more results the system must find and list. Longer time periods can take longer to generate. The audit log history for any given account is typically restricted to the last 2 years. A new Staff User filter allows businesses to quickly review all of one staff members’ recent actions! By default, all staff member actions are included. Once one or more staff members are selected in the filter – the activity which took place from the other staff accounts will be hidden. A new Sources filter allows businesses to quickly review activity by the access point that was used. By default, all areas are included. Once one or more options are selected in the filter – the activity which took place in the others will be hidden. Office Portal – will filter to any activities performed in the main iClassPro application. Staff Portal – will filter to any activities performed in the mobile-based Staff Portal.